Organic. Wheat & gluten free. Low fat. Suitable for vegans and coeliacs. Vegetarian Society approved. 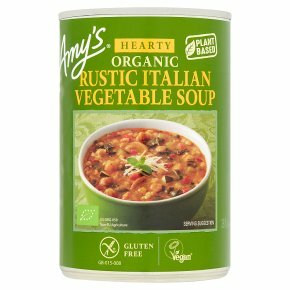 Kosher - Pareve.Our Hearty Rustic Italian-style Vegetable soup, made with protein-rich organic chick-peas, is so packed with organic vegetables, brown rice and mushrooms that it should satisfy the heartiest of eaters. (800 W): Empty contents into microwavable container. Cover and heat on full power for 2 minutes.Stir and heat another 1-2 minutes until piping hot.